All citizens pay attention. The jury’s decision on Sept. 24 was a devastating blow to the governmental agencies who are claiming a “win.” Here is a bit of history for context, important details and a call to concerned citizens. In Nov. 2013 a group of North County landowners filed an action called quiet title, in response to the San Luis Obispo County Board of Supervisors discussions about water and an urgency ordinance. This emergency ordinance punished landowners while the Cities could continue to build new hotels and homes. The Quiet Title named San Luis Obispo County, Paso Robles, Atascadero Mutual Water Company, Templeton CSD and San Miguel CSD in the action. These landowners simply want to quiet the titles to their properties to protect their right to reasonably use groundwater on their properties as guaranteed by the California Constitution. The government answers in Dec. 2013 were telling. The primary claim of the government entities (not Atascadero Mutual Water Company) was prescription. Prescription* means the government entities were claiming that they had already taken more water from the basin over a five-year shortage, known as “Overdraft.” The legal elements of prescription are “open, notorious, hostile, adverse and continuous with proper “notice” to landowners.” This claim confirmed suspicion that the government entities were aggressively pursuing theft and a taking. Judge Kirwan in Santa Clara Superior Court determined that a jury trial was appropriate for Phase 3 of the case and ordered a jury trial to commence Aug. 26. Every day of the jury trial, North County residents traveled north to witness the trial. Our group was often outnumbered by the government attorneys and their jury consultant team. District five Supervisor Debbie Arnold was the only elected official to attend the trial. Key witnesses for the government attempted to redefine “overdraft” in order to allow the government entities the broadest possible ability to prove prescriptive rights. This fabricated definition is completely inconsistent with the State (DWR) and San Luis Obispo County’s own water studies (see below). SLO County and Paso Robles’ testimony on cross examination included admissions that “there has been no declaration of overdraft for the basin,” said Courtney Howard, San Luis County Water Resources Division Manager. 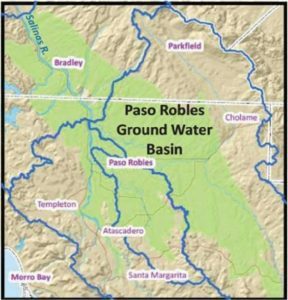 “None of the previous technical reports have concluded that the Paso Robles groundwater basin is in overdraft,” said Christopher Alakel, Paso Robles Water Resources Manager. The 12 member jury found that SLO County, Paso Robles, Templeton and San Miguel had proven their case for a minuscule amount of water from 28 to 37 years ago (1981-1990). Prescription was awarded for only the years 1981 through 1990. This means that if the basin ever enters a true overdraft, the government entities would be able to use the court determined amount of water. Those who sell water may only do so in surplus and in declared shortage they may only pump and sell the court determined amount. A key piece of information that the government fought hard to keep out of evidence is known as Paso Robles Groundwater Basin Agreement or PRIOR Agreement. The agreement was signed by SLO County, Paso Robles, San Miguel and a number of landowners in the basin who are not part of the quiet title action on or after Aug. 19, 2005. The Agreement also says that it cannot be terminated unless “The District (SLO County) has made a determination based on published studies that the basin is in a condition of overdraft” and does so in a “noticed public hearing.” Why did government entities fight so hard to keep this agreement out of court? Why didn’t SLO County fulfill their obligation to the agreement by declaring overdraft? Does this agreement truly protect landowners? Is the agreement even valid today? Why are government entities spending your tax dollars fighting landowners who simply want to protect a basic right? Why try to prove that the basin is in overdraft when County and City employees are on the record saying just the opposite? Why claim that there was notice of overdraft when a scientifically based overdraft has not been determined or declared? Why did government witnesses who are expected to serve all citizens, make claims in public meetings which conflict with their own testimony in court? Getting to a jury trial and through the prescription phase was a huge win and a giant step toward a judgement of quiet title for landowners. The jury award of a minuscule amount of prescription for a time frame from the distant past was a huge win for landowners. The most recent period (2006- though 2010) over which entities claimed prescription was denied by the jury. Additionally, an overdraft in 2011 through 2018 was not even claimed by government! The DWR declaration of critical overdraft of the Paso Robles Groundwater Basin is a political designation, not based in true science (Fugro 2002, 2005, Anthony Daus, landowner expert, GSI Environmental testimony). SLO County and the City of Paso Robles political actions, since 2008 when they were awarded grant money for a banking feasibility study, are highly questionable. The city of Paso Robles groundwater well fields near the airport include five wells within a four square mile radius, the center of the “red” where water tables are dropping (Alakel). Why would the city continue to pump from that region? Quiet Title: The means through which to protect property from trespassing, in this case theft of an underground resource and the priority right to use it. California Constitution: Landowners have the right to reasonable and beneficial use of the water under their property on their property. Prescription: The elements of proof are that the theft of the right must be open, notorious, hostile, adverse in “overdraft.” Prescription is claimed over the entire basin, not just against landowners who have chosen to protect their rights in court. Greg Grewal is a decorated, retired LA City fireman who owns ranch land in East Paso Robles. Greg serves as Debbie Arnold’s appointee to the Water Resources Advisory Council. All studies, court testimony and court evidence is public record and will be provided upon request to concerned citizens. Why does nobody see the irony that this guy, Steinbeck and their sheep facilitated the County gaining control, through SGMA, of 61% of the basin’s water. You have just witnessed one of the most blatant property grabs in the history of the north county. To rub the salt in, consider it was perpetrated by a supposed conservative majority. Actually you overlooked the fact that this action, initiated by Steinbeck, has remedied any appearance of negligence, a wishful need for the taking. The court, per my very expensive experience, can make a determination of negligence by the property owner and perfect a prescriptive right to the party that claims a right adverse to the right of the owner. This is legalized thievery, not ethical but a legal maneuver to benefit from the ignorance of another. Thankfully Steinbeck got of the fence and performed do diligence. No, SGMA’s purpose is resource management, not resource control. SGMA explicitly states it does not address or affect water rights. The court determined those in favor of the Steinbeck group. Further, since the court found that the basin is not in overdraft, let alone critical overdraft it is questionable if SGMA even applies. And yes the conservative majority decided that they would prefer the management of our water to be controlled by an elected representative body, not by an unaccountable handful of large property owners and city developers. If the County will lie about the Paso Basin, then what makes us so sure every other basin identified as in “overdraft” is actually in overdraft? It’s a question. thence representation for whatever public benefit that may be appropriate. We fund these agencies through taxes, fees and whatever revenue stream that can be approved through the public process, a well articulated series of public meeting. Yes, they regularly have them and many times attended by more staff than the victimized public. In short I use the word “victimized” because the playing field is typically like this, the staff gets paid and the public volunteers to attend. As you can see there is no career in attending public meeting unless you are the staff, who deserve reasonable wages and benefits. These staff costs are approve at public meetings too. Most people don’t get paid time off to attend these many public meetings. This is the government process we elect or hire to look after everyone’s best interest. Sadly they have afforded the cost of government to become underfunded affecting priorities, pensions and payroll that our public meetings have approved. This is the where NEW REVENUE STREAMS are aggressively being pursued, self help this and that, to free up the lack of revenue that once came from other agencies, state or feds. Now we go to the CASH COWS, water, sewage and garbage. Garbage is a difficult one for government to own but boy can they regulate it, let the privateers own them. Now we get to Water and Sewage, JACK POT!!! This is where government will do whatever to control this REVENUE STREAM. Need more money, justify a rate increase, that simple. So why do these jurisdictions spend a ridiculous amount of tax dollars to perfect a thievery from the private land owners? They need to because of their mismanagement of public funds that have benefited themselves over the benefit for the general public. The illusion is over when government is using adverse possession, a form of squatters rights, and taxpayer dollars to fight the private property owners for a taking of their basic right of ownership. Yes they have the money because they can just raise your water rates and get paid to do it. Seems to me the court decision was a victory for the public agencies; they now have a right to pump some water from the basin. Without the prescription they were awarded, they could be facing a situation where they couldn’t pump any water. Any amount is better than no amount in my mind. So what’s the punishment for these agencies? They used tax dollars for the suit. Do they use tax dollars again? Part of the why is easy: bureacracies are invested in private, for profit enterprises. The Tribune has a different spin on this. Should we be surprised? Their deceptive headline reads: SLO County claims a victory in ongoing legal battle with landowners over water rights. Why would they report the entire truth? The county won a very small battle but lost the big war.